I create tons of soccer logos, but they are usually for regions or local clubs. Once in a while I get the opportunity to create one that has larger reach. This logo for a national tournament is great example. So far it has been only been used for social media and emails, but I know it will be used on many more products. Planned products include t-shirts, pins, medals, hats, sweatshirts, banners, referee patches and more. 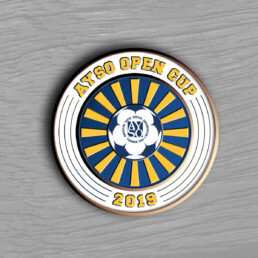 The included mock-up of a referee coin (these are a must for any soccer tournament) is as true to the logo as I can keep it while still adding some dimension to the coin.